people from countries you might not ever have given serious thought to, and a legendary pitching forum. The festival showcased five of the 15 documentary features on the Academy Awards short list, and many more that demonstrate the vast expressive world beyond that measure. Festival director Ally Derks opened the festival with a challenge to Dutch authorities who have announced a 25 percent cut in cultural funding: "Those who would cut arts funding so dramatically should be reminded that culture is the measure of a civil society." She later led festival-goers in a collective "scream for culture." streets, holding signs reading "Where's My Vote?" the regime cracked down with shocking and extreme brutality, which caught protesters by surprise. 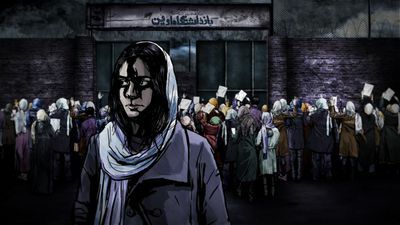 Ahadi constructed a tight narrative about a peaceful democratic movement betrayed using Twitter feeds, mobile phone video, international news and interviews with a few of Iran's many young bloggers, creating continuity with cleverly executed animation. human rights official. The film relentlessly builds a human rights case against the US government, not just in the case of this child soldier but against those subjected to torture and military justice in Guantanamo. 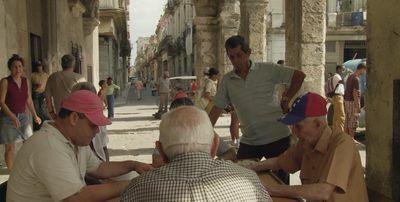 Soy Libre, by German film student Andrea Roggon, plunges viewers into an intimate portrait of Havana by juxtaposing meditative monologues of anonymous Cubans--intelligent, reflective, disaffected, hungry for freedom but without experience of choice--with extended observations of daily life in Cuba, filmed with an eye for composition. The only identified voice is that of blogger Yoani Sanchez, who argues here as elsewhere that Cubans need to see themselves as social and political actors in their own society. She argues that it needs to start with the moral torpor into which many (including other monologists) have sunk: "Freedom means being able to say, ‘There is no freedom here. '...My soul is like a corpse." She thinks it is possible to revive the Cuban spirit; others just want to marry a foreigner and leave. of Bernie Madoff, all showed at the fest. One of the unexpected viewing pleasures at IDFA was Cinema Komunisto, Mila Turajilic's delightful and disturbing nostalgic look back at Yugoslavian filmmaking in the Tito era, when the Yugoslavian government built impressive soundstages and trained technicians to serve a worldwide commercial filmmaking industry, especially targeting Hollywood. 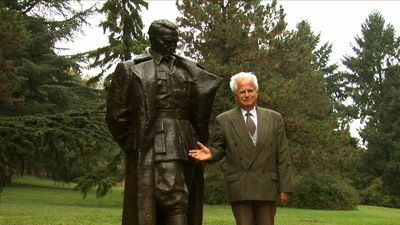 It is chastening to see the decay of the former Yugoslavia embodied in the luxurious villa of Tito, which, after becoming a museum, was bombed by NATO forces in 1999. Tito's projectionist, who showed him a film a day, revisits the villa and stands in the ruins of the palatial living room where he once showed Hollywood westerns and crime dramas to the Marshal and his wife. Cinema Komunisto is about popular culture, ideology, history and memory. For aficionados of emerging and interactive documentary, IDFA has DocLab, this year housed in the Brakke Grond arts center. Among the 20 projects showcased was Katerina Cizek's HIGHRISE/Out My Window, a remarkable experiment funded by the National Film Board of Canada. The Web-based interactive documentary gives viewers a glimpse into high-rise apartment-living around the globe. It won the first IDFA DocLab Award for Digital Storytelling. noted that the Forum had shrunk the size of the main sessions, with smaller sessions--where potential investors could target their interests and projects with less than a quarter of funding secured could be pitched--increased. At the same time, main-session pitches found substantial interest; indeed, they often seemed pre-scripted, with many programmers indicating they already had meetings set up to discuss the project. There was much buzz about alternative and digital distribution but no indication in the types of Forum projects pitched--at least those I saw--of the importance of building such considerations into design. A panel on youth media online, in which I participated, showcased recent work promoted by the European Cultural Foundation, much of which looked film-school familiar. This session also had no answers for how to raise funds or collect revenue online, although I brought some examples of projects whose participation in ArtsEngine's Media That Matters Festival had brought returns both in attention and dollars. (That presentation is up on Slideshare. ) There and elsewhere, there seemed to be general agreement that broadcasting continues to be key to financing, even when a filmmaker's revenues come from DVD sales, and online sales continue to be puny. which has its annual meeting at the International Documentary Festival at Amsterdam, featured a workshop on the implications of the fair use movement for Europeans. It was co-sponsored by The European Federation of Film Directors (called FERA, its French acronym). In Europe, each nation has its own copyright policies. They all include exceptions to copyright ownership, some more flexible and expansive than others. Producers shared their experience of frustration with licensing--and their admiration for the US fair use best practices movement. Dutch legal scholar and expert on European law Bernt Hugenholtz then explained that many European nations have exemptions, which he encouraged filmmakers to use to the maximum. He also noted that the Berne convention encourages nations to adopt exemptions that many nations have yet to adopt, but could, with some encouragement from creators and users. Feature-Length Documentary and the Dioraphte IDFA Award for Dutch Documentary, was primarily focused on camera techniques. He demonstrated his "single-shot" scenes and the angles he uses to get extremely close to subjects without alarming them. American producers had a wealth of opportunities to engage with potential partners and purchasers. Lisa Leeman, who brought her One Lucky Elephant, was hoping Jan Rofekamp's Transit Films could identify worldwide buyers. Jennifer Fox's My Reincarnation , about a Buddhist spiritual leader and his son, who is reluctant to follow in his footsteps, was showcased. She has already placed the film in venues such as the US public TV series POV. But she enjoyed the pleasure of watching the Dutch Buddhist community (which will also see the film on the Dutch Buddhist broadcasting channel) respond to the film. "Thank you for this unprecedented film," one viewer said. "We know the spiritual stature of these leaders, but you let us see them as human beings as well." industry screenings as well as many other films on its six screens. Pat Aufderheide is director of the Center for Social Media at American University.